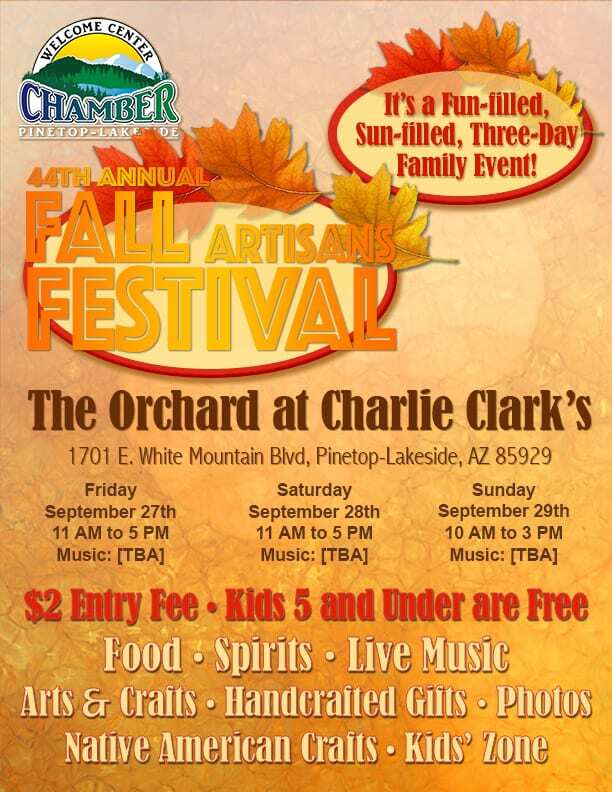 Come join us for one of Pinetop-Lakeside’s heritage events—the 44th Annual Fall Artisans Festival! The Fall Artisan Festival features handmade crafted items by artisans from all over the country. Each artist displays and sells their own unique designs from jewelry to paintings to woodwork. The 44th Annual Fall Festival has something for everyone! 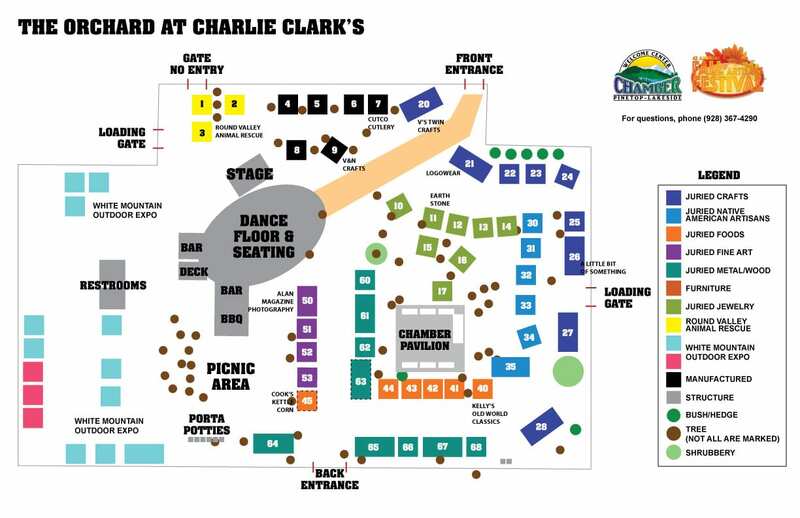 Located in the beautiful Orchard at Charlie Clark’s in Pinetop, the festival begins Friday, September 27th and runs through Sunday, September 29th. There will be live entertainment on Friday from 11:00 – 3:00 pm, Saturday from 12:00 – 4:00 pm, and Sunday from noon – 3:00 pm. 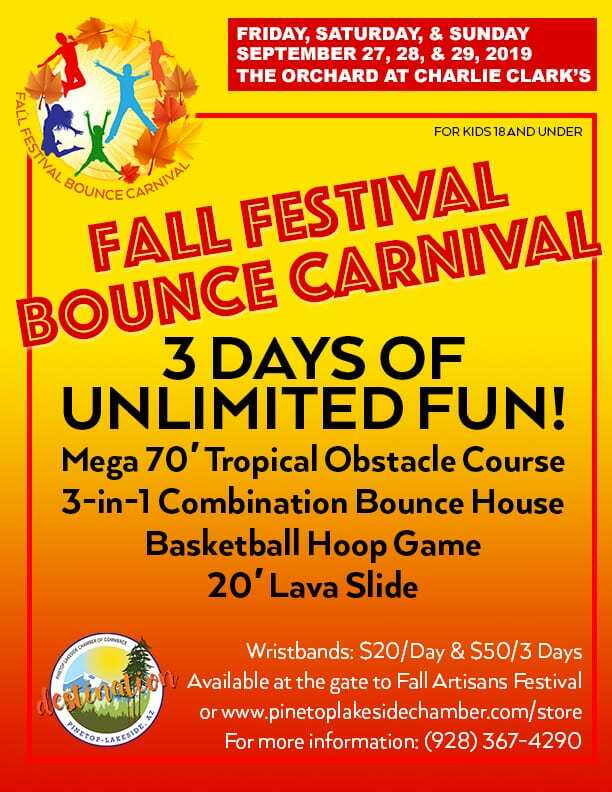 For the first time, in addition to our arts festival, we have added the Fall Festival Bounce Carnival to make this an event for the entire family. In addition to the Kids’ Zone at the White Mountain Outdoor Expo, your children can enjoy an entire day at the bounce carnival. Wristbands will be available online as the date gets nearer. There is a $2 per person entry fee. Children 5 and under are free. Each party will also receive a swag bag containing coupons and other giveaways from chamber members—while supplies last. 50/50 Raffle Tickets are $5 each or 5 for $20 for persons over 16. The winner will be drawn at 3 PM on Sunday. You need not be present to win. A 501(c)(6) nonprofit, the Pinetop-Lakeside Chamber of Commerce strives to promote tourism to improve the local business environment, foster a vibrant economy, and collaborate with the town, region, and state to enhance the overall economic quality of Chamber members’ businesses. Our fundraising activities, enable us to hold events such as the Wine in Our Pines, White Mountain Beer & Music Festival, 4th of July Mutt Strutt, Spectacular Red, White Mountain, & Blue Bash, Fall Artisans Festival, and Fall Festival Bounce Carnival, which entice visitors to come to the White Mountain and discover Arizona’s wondrous playground below the towering ponderosa pines.